Putin Calls Claims Of Syrian Chemical Attack 'Nonsense' : The Two-Way The Russian leader says claims made by the U.S. are "nothing more than a provocation" for a military strike on the regime. 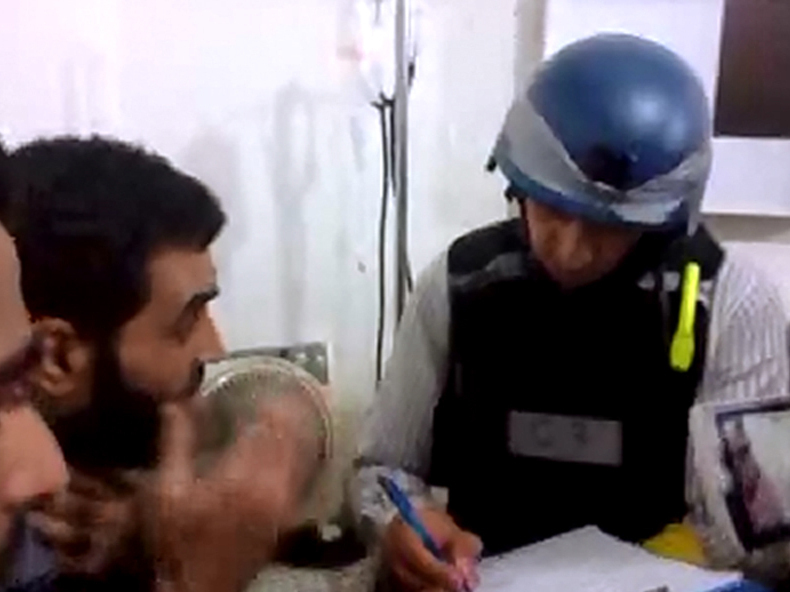 An image grab taken from a video posted by Syrian activists earlier this week allegedly showing a U.N. inspector listening to the testimony of a man in the Damascus suburb of Moadamiyet al-Sham. Russian President Vladimir Putin called U.S. claims that the Syrian regime has used chemical weapons "utter nonsense" and urged the White House not to launch a retaliatory strike. Putin, speaking to reporters in the far eastern Russian city of Vladivostok, said he was convinced that reports of a chemical attack against opponents of the Syrian regime are "nothing more than a provocation by those who want to drag other countries into the Syrian conflict, and who want to win the support of powerful members of the international arena, especially the United States." Moscow, a key Syrian ally, has blocked a United Nations Security Council resolution authorizing the use of force against Damascus. The Russian leader's remarks come after U.N. weapons inspectors left Syria, wrapping up a four-day mission to collect evidence of a suspected chemical attack, as NPR's L. Carol Ritchie reports. The departure of the inspectors is seen as paving the way for a possible U.S. military strike. Several cruise-missile-armed American warships are on station in the Mediterranean. Russia has also sent two naval vessels to the region. On Friday, Secretary of State John Kerry and President Obama laid the groundwork for a possible strike, with Kerry saying the evidence that Syrian President Bashar Assad's regime used nerve agents against rebels and civilians on Aug. 21 was clear "and compelling." He called Assad a "thug and murderer" and warned that without consequences, there would be "no end to the test of our resolve ... It matters if nothing is done." The White House says 1,429 people were killed in the attack. The AP and Reuters are reporting that U.N. experts that left Syria carrying blood, urine and soil samples, have arrived in the Netherlands, where the lab analysis will take place. The U.N. has said it will try to expedite its final report. A White House official says Kerry, Defense Secretary Chuck Hagel, Director of National Intelligence James Clapper and National Security Advisor Susan Rice will hold conference calls about Syria on Saturday afternoon with the Senate Democratic Caucus as well as the Senate Republican Conference, according to Reuters. The calls, which will be unclassified, are part of "the Administration's consultations regarding the Assad regime's use of chemical weapons in Syria on August 21," the official said.